3) Build a wooden frame around Reg. This will carry the torso once the supports are removed. 4) Tie Reg’s torso to the wooden frame with cotton straps, so it will be suspended. 5) Remove the limbs. 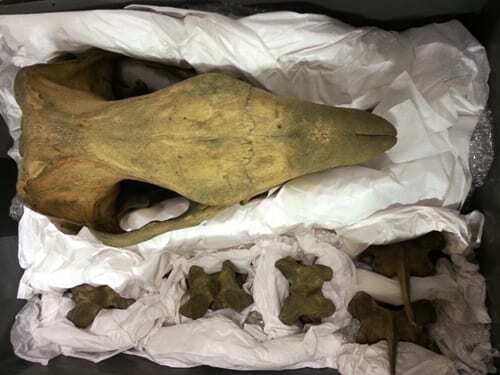 These were not actually fixed to the skeleton – they sat on the metal uprights, with a hole drilled through the femora and humeri which held them in place. Most of the individual elements of the limbs are so closely wired together, with thick curved metal, that we decided it would risk too much damage to remove the wires. 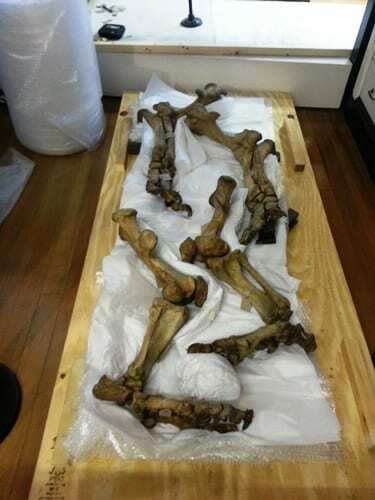 Each limb will travel largely in one piece. Reg the rhino with his limbs removed. You can see the metal upright supports which hold the skeleton. 6) Remove the rear metal upright support and unscrew the front one from the base. The weight of the rhino is now completely taken by the cotton straps tying it to the frame. The complete torso will travel in one piece. 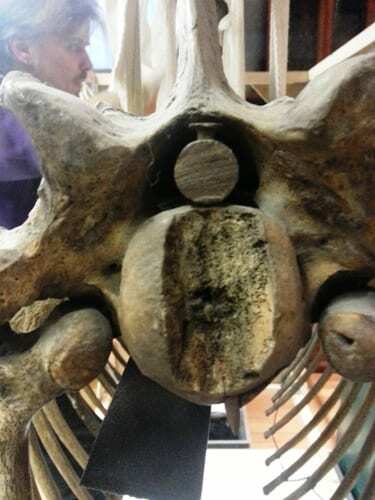 There is a metal pole running the length of the spine, slotted through the vertebrae’s neural canals, and a number of the vertebrae are also joined to their neighbours with a thin rod drilled through the centrum (the body of the vertebra). 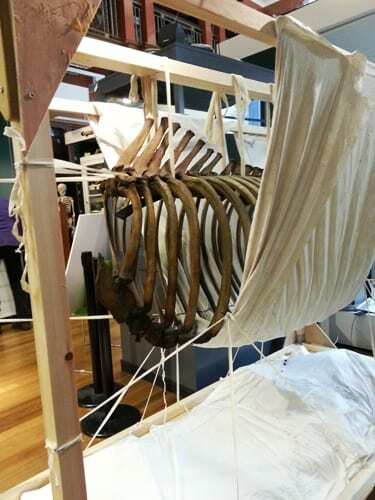 The fragile ends of the ribs are joined to each other and the vertebrae with thick twisted wire. It would cause far more damage to remove this wire and pack each element separately than would be risked by keeping it in one piece. 7) The entire structure is then lifted backwards. This allowed us to access the skull, which was too close to the wall to manipulate up to this point. 8) Detach the wires which connect the skull to the torso. The front metal upright bends forward where it hits the spine. It carries the neck vertebrae and extends into the skull (and in fact takes most of the skull’s significant weight). 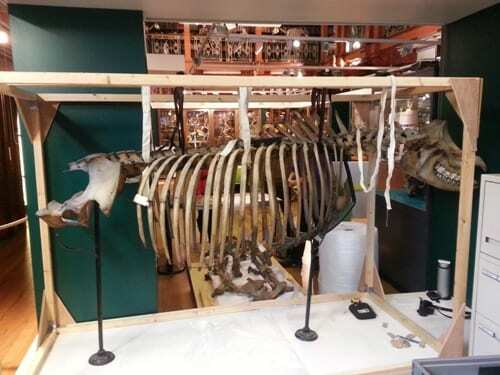 The skull and neck vertebrae are removed and packed individually. The front support is then detached from the spine and removed. We found that some of the methods used in 1911 to mount the rhino can only be described as brutal. Where the metal spine rod met the front upright support the body of the vertebra had been scooped out, and a very thick nail was driven vertically through the rod and the end vertebra to stop it moving forward on the pole. Not exactly what a modern preparator would do. 9) Additional straps and cradles were added to evenly spread the weight, and to stop any sideways movements for Reg’s road trip. The whole structure was then lifted off the plinth and fixed onto a base for traveling, before extra protection was added. 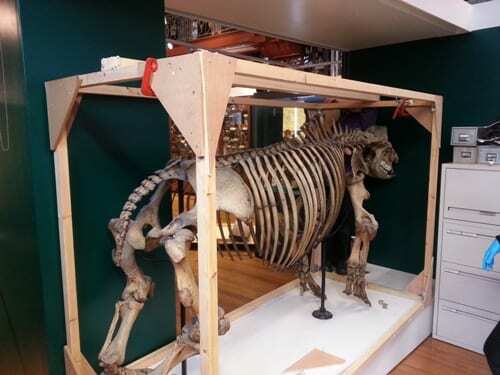 10) Finally, a large team of Curators from UCL Museums was gathered to carry Reg out of the Museum and into the lorry. The rhino has left the building. Reg will return at the end of January 2015. You can support the Bone Idols Project on our online giving page. 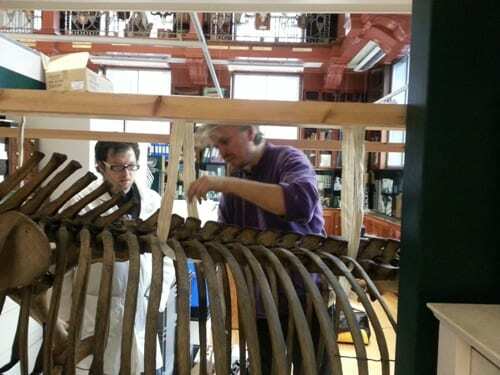 Ahead of this work we gave our Twitter followers the chance to name the rhino skeleton. We had a lot of great suggestions, from Albrecht (after the artist Albrecht Dürer, whose rhino depiction was so significant in Europe’s early concepts of the animal) to Rhino Neal (as in Ryan O’Neal, the actor). The team here were most persuaded by Lauren Maskell who suggested we call him Reg, after the Museum’s founder Robert Edmond Grant (R.E.G. ), and so that is officially now his name. We hope you approve. Lauren will be getting a copy of John Wright’s brand new book The Naming of the Shrew: A Curious History of Latin Names, donated by Bloomsbury Publishing. Anthony Chau and Charlene suggested Reginald so books are headed there way too. We also liked Douglas, after conservation campaigner and author Douglas Adams, founder patron of Save the Rhino International, which was suggested by Matt Thomson and Elizabeth Whitebread so they get books too. What a great day to be a UCL curator! What is going on Reg’s plinth to keep it warm until his return? The Galapagos toroise (in his shiny new case that also resulted from the Bone Idols project), the giant ammonite, the bottle-nosed whale skull and the mammonth tusk are keeping Reg’s plinth warm until January.